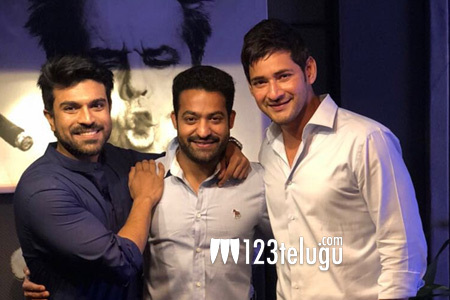 For the past few weeks, the bonding between three of the biggest stars in the industry – Mahesh Babu, NTR Jr, Ram Charan – has been the talk of the town. While NTR Jr attended the pre-release event of Mahesh Babu’s Bharat Ane Nenu, the trio at an after party the same night. Not just that, both NTR and Mahesh Babu praised Ram Charan for his outstanding performance in Rangasthalam. Today, once again, the trio bonded big time to celebrate the success of Bharat Ane Nenu. This time, it was Ram Charan and NTR who praised Mahesh Babu for his intense performance in Bharat Ane Nenu, and also congratulated the whole team of the film for their big success. The three met once again at a private party and their photograph has already gone viral on social media. No wonder, fans of the three actors have praised their friendship, and the stars are truly winning hearts one photo at a time.